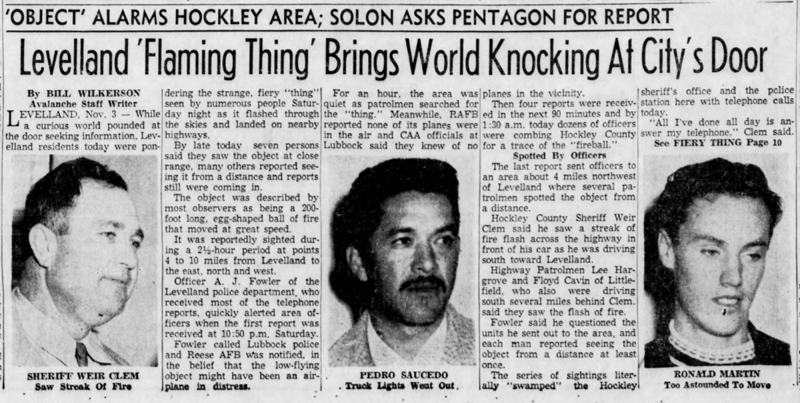 The incident began late on the evening of November 2 when two immigrant farm workers, Pedro Saucedo and Joe Salaz, called the Levelland police department to report a UFO sighting. Saucedo told police officer A.J. Fowler, who was working the night desk at the police station, that they had been driving four miles west of Levelland when they saw a blue flash of light near the road. They claimed their truck’s engine died, and a rocket-shaped object rose up and approached the truck. According to Saucedo, “I jumped out of the truck and hit the dirt because I was afraid. I called to Joe but he didn’t get out. The thing passed directly over my truck with a great sound and rush of wind. It sounded like thunder and my truck rocked from the flash…I felt a lot of heat.” As the object moved away the truck’s engine restarted and worked normally. Believing the story to be a joke, Fowler ignored it. An hour later, motorist Jim Wheeler reported a “brilliantly lit, egg-shaped object, about 200 feet long” was sitting in the road, four miles east of Levelland, blocking his path. He claimed his vehicle died and as he got out of his car the object took off and its lights went out. As it moved away, Wheeler’s car restarted and worked normally. To read Dr. J. Allen Hynek’s report on the Levelland case, click here. 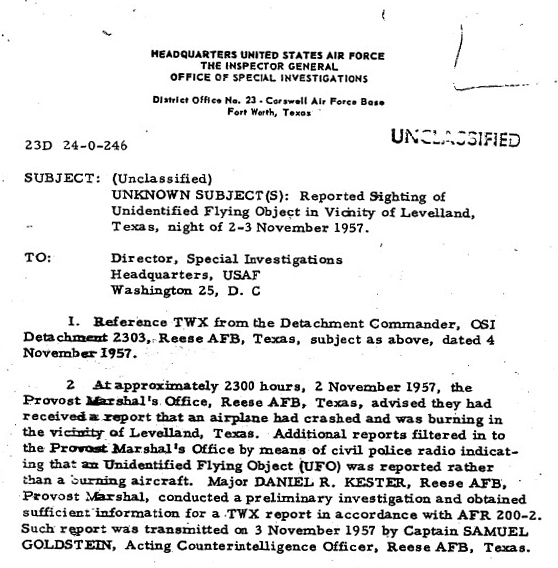 In March 2002, Dallas-based television station KDFW aired a report about the Levelland UFO case. Reporter Richard Ray’s piece recounts how at least 15 people, including Sheriff Weir Clem, claimed to have seen the strange object. Ray spoke to Weir’s widow and friends, who believe that the lawman definitely saw something unusual. The story also detailed the investigation and controversial conclusion issued by the Air Force – that weather phenomena known as ball lightning was to blame.